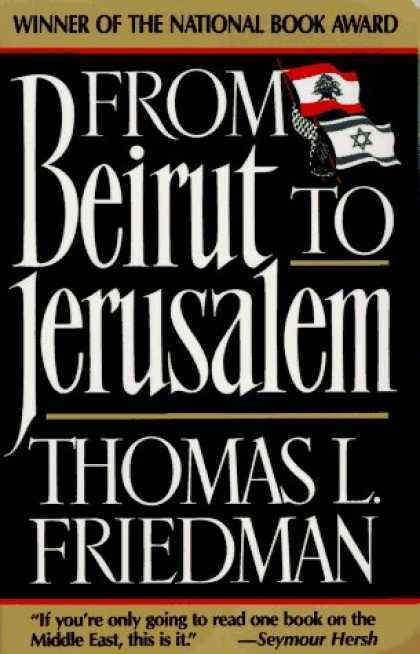 The third book on my summer reading list was From Beirut to Jerusalem by Thomas Friedman. Some of you may know that I particularly dislike Friedman’s current Op-Ed pieces where he parachutes into a city and makes outlandish claims. But this book, does not fall into that category. Apparently there are definitive good Friedman and bad Friedman eras. To start off this book is not the place to go for a primer on Lebanon or even Beirut. Friedman has relatively little to offer that isn’t covered better elsewhere when it comes to understanding the state of Lebanon. I would recommend Fisk or Mackey for that. From Beirut to Jerusalem is a bit like extended Op-Ed pieces on several different topics, which is what he’s best at. In the Beirut section Friedman tackles the PLO, particularity Arafat, Beirut psychology, and the nature of Middle East governments in general. His ability to explain things in a way a Western audience understands is the selling point of his writing, it particularly shines through when he explains the reasoning behind government decisions in the Middle East, what he calls “Hama rules.” That being said the Beirut section is defeintly the weakest part of the book, it is often repetitive with writing on Lebanon and the Palestinians thats covered in more depth elsewhere. PLO failed to make any settlement when they had the chance. Their leadership was hopelessly disorganized. Tribalism and self preservation guide most decision making by Middle East governments. Their history is one where the most powerful man must be ready to ruthlessly defend his honor, property and territory and are ready now to do the same. Friedman compares this way of self preservation to the rationale behind brutal suppression of dissidents in a rulers country, like the Hama massacre. Labor and Likud really aren’t that much different. Israel lacks its own definitive identity and can’t be a serious player in making peace and determining another states identity until it figures out who it is. The differences between secular Israelis, Orthodox Jews, messianic Zionists, and ultra-Orthodox is what keeps the country do divided, particularly on the peace plan. Israel has no real reason to give up its land. It has almost all the power in the peace process and It feels more secure with the current limited threats than creating a state for its adversaries. No countries willingly give up land. Israel is featured so prominently in the media because of its connection to the Bible, the way the Western world views the world. Israel is held to a higher standard by most and people love reading about its misdeeds or successes because of that Bible connection, so other countries where worse things could be happening get less attention. I read this book recently and my impression is overall neutral. He provides some fairly interesting insights into life in Beirut. What I disliked, however, is this: for the first half of the book (Beirut) he overall praised the people living there, in harsh circumstanced, still living their lives. And then comes the second half of the book (Jerusalem) which he uses to bash Israelis, accuse them of living in victimhood mentality and blaming politicians and taxi drivers for being corrupt. And it’s true they are corrupt. But couldn’t he find positive things to say about Israelis? Is it fair to spend half a book to criticize Israel?